Use posts that are longer than 8 feet if you want to make the enclosure taller, but dig the holes a little deeper. Pheasants prefer living in fields or on farmlands with dense brush they can shelter in during inclement weather or when nesting. Females sometimes retreat to brush to escape overzealous males during mating season. For these reasons, pheasant pens should contain plenty of plants and brush to accommodate the pheasants' needs. When planning the size and layout of your pheasant pens, allow 10 to 12 square feet of space per adult bird. Draw the layout for your pheasant pen to determine the number of posts you will need. Posts should be 10 feet apart on center. A 500-square-foot retangular pen, measuring 10 feet by 50 feet, would require 6 posts down each side, plus one additional post for a gate support. This size of enclosure would comfortably house 40 to 50 adult pheasants. Dig post holes 2 feet deep around the perimeter of each pheasant pen at 10-foot intervals. Add an extra post hole 3 feet away from one of your support posts to allow for a gate. Center an 8-foot four-by-four in each post hole and fill each hole with quick-set concrete. For best results, mix the concrete in a wheelbarrow and shovel it into the hole around the post. Use a level to ensure that each post is plumb, and use a measuring tape to ensure that the center of each post is 10 feet from the center of the next. Allow your concrete to dry for the length of time directed by the manufacturer before proceeding. Dig a ditch at least 12 inches deep around the perimeter of your enclosure. You'll extend the wire mesh surrounding your enclosure into this ditch to prevent predator incursion. Nail or screw 10-foot-long two-by-fours between the posts, around the top and bottom of your pen. Install wire poultry fencing or 1-inch wire mesh around the perimeter of your enclosure except for the gate opening. Extend the mesh into the bottom of the ditch. Attach the wire mesh to the framework using heavy-duty staples. Once the mesh is secure, fill in the ditch and tamp it down. Frame a gate with two-by-fours. Cover the gate with poultry wire, attaching it with staples. Attach two hinges to one side of the gate and a gate latch to the other side. Prop your gate up in the opening so it is centered and lines up with your support posts. Using a pencil, mark where you will affix the hinges to the support post with screws. Have a helper hold the gate in place while you screw the other half of each hinge to the support post. Cover the enclosure with poultry netting. Pull the netting snug enough that there are no gaps or pockets that would allow your birds to escape or get caught, but not so tight that a bird could harm himself if he startled and suddenly flew into it. Attach the netting by stapling it to the upper framework of the pen. If you have a large enclosure, build a support for the netting in the center of your pen by sinking two four-by-fours into the ground, 2 to 3 feet apart. Nail or screw another four-by-four across the top of the posts. Your center post should be at least 1 foot taller than your perimeter posts. Provide shade for your pheasants. Inside the enclosure, plant a variety of shrubs and grasses such as alfalfa, cattails, millet, corn, mustard, wild plum, choke cherry or willow. Cover part of the enclosure with burlap or a tarp. Attach it securely enough that it won't flap on windy days. 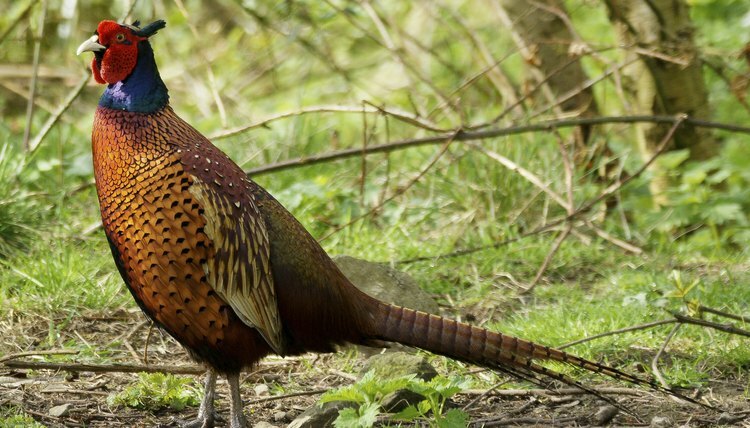 Flapping tarps or canvas can startle pheasants, causing them to panic. Install feeders and waterers, which you can purchase from your local farm supply store.